This page provides two charts that plot the quality ranks of 5 Europe-based automobile manufacturers - Daimler, Volvo, BMW AG, Volkswagen AG, and Saab. Each chart employs a different method for computing the quality rank of the manufacturers. The statistics used in the computations for ranking the car makers are those found within the April issues of Consumer Reports. The two sections providing the necessary statistics are CR's Used-Cars-To-Avoid lists and its reliability charts. Reliability is defined by the magazine as the infrequency of serious problems, which it measures annually by a subscriber survey. The first graph provides the ranks of the above 5 car makers based on each manufacturer's infrequency of trouble-prone models. These ranks provide a measure of how well each manufacturer's models successfully avoided the bottom end of the model-quality spectrum for the years 1980, 1985, 1990, 1995, 2000, 2005, and 2010. The second graph provides the ranks of the above 5 car makers based on the average of the overall reliability ratings of each manufacturer's models. The second ranking provides a measure of how well a manufacturer's models performed over the entire model-quality spectrum in each of the years 1975, 1980, 1985, 1990, 1995, 2000, 2005, and 2010. To form a car-manufacturer quality measure from each of the annual lists of Used Cars To Avoid, the first step is to count each manufacturer's entries on the list. Each model year of each model is treated as a separate entry. Next, as the number of automobile models sold by a car manufacturer varies greatly from maker to maker, it is necessary to take account of the fact that a manufacturer with more models has a greater opportunity to have more model years of low quality. 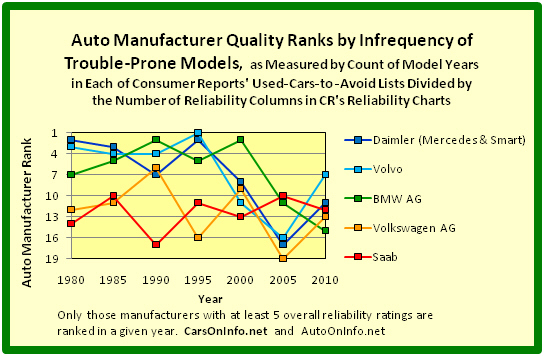 To compensate for a possibly inflated, or deflated, frequency of trouble-prone model years of a manufacturer, as well as a variability in model data sufficiency, the number of a manufacturer's entries in a Used-Cars-To-Avoid list is divided by the total number of overall reliability ratings for the manufacturer found in the reliability charts of the same issue of Consumer Reports. Finally, the automobile manufacturers with at least 5 overall reliability ratings are ordered from best to worst for each of the years 1980, 1985, 1990, 1995, 2000, 2005, and 2010. The best manufacturer in a given year has a quality rank of 1. The worst quality rank varies from year to year and ranges from 13 to 19. Automobile manufacturers with a rank in at least one year include American Motors Corporation, BMW AG, the Chrysler Group (previously Chrysler Corporation, the Chrysler Group of DaimlerChrysler AG, and Chrysler LLC, and presently Chrysler Group LLC), Ford Motor Company, Fiat S.p.A., General Motors Corporation, Honda Motor Company, Isuzu Motors Ltd., Jaguar, Kia Motors Corporation, Mazda Motor Corporation, Daimler AG (previously Daimler-Benz AG and the Mercedes-Benz division of DaimlerChrysler AG), Mitsubishi Motors Corporation, Nissan Motor Company, PSA Peugeot Citroën, Porsche AG, Saab, Fuji Heavy Industries Ltd., Suzuki Motor Corporation, Toyota Motor Corporation, Volkswagen AG, and Volvo. For several of the above years, Saab was a division of General Motors Corporation and Volvo and Jaguar were divisions of Ford Motor Company; however, for all of the above years, they have been treated as separate companies. The quality ranks of the above five automobile manufacturers by these computations are given for each of the above years in the first graph below. To compute car-maker quality ratings and compute a quality rank using Consumer Reports' overall reliability ratings, a number is first associated with each of CR's overall ratings. A +1.0 is ascribed to a rating of Much Better Than Average, a +0.5 to a rating of Better Than Average, a 0 to a rating of Average, a -0.5 to a rating of Worse Than Average, and a -1.0 to a rating of Much Worse Than Average. Then an average is taken over all of the manufacturer's model years and models offering an overall reliability rating. 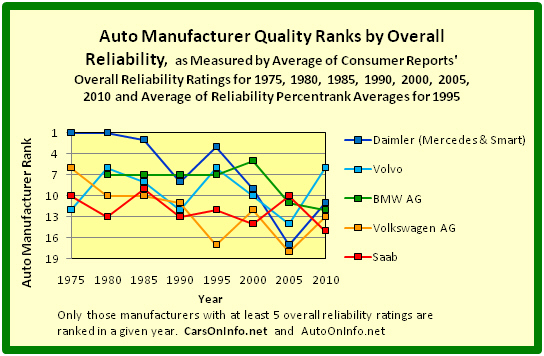 Lastly, the automobile manufacturers with at least 5 overall reliability ratings are ordered from best to worst for each of the years 1975, 1980, 1985, 1990, 1995, 2000, 2005, and 2010. The best manufacturer in a given year has a quality rank of 1. The worst quality rank varies from year to year and ranges from 13 to 19. Automobile manufacturers with a rank in at least one year include American Motors Corporation, BMW AG, the Chrysler Group (previously Chrysler Corporation, the Chrysler Group of DaimlerChrysler AG, and Chrysler LLC, and presently Chrysler Group LLC), Ford Motor Company, Fiat S.p.A., General Motors Corporation, Honda Motor Company, International Harvester Company, Isuzu Motors Ltd., Jaguar, Kia Motors Corporation, Mazda Motor Corporation, Daimler AG (previously Daimler-Benz AG and the Mercedes-Benz division of DaimlerChrysler AG), Mitsubishi Motors Corporation, Nissan Motor Company, PSA Peugeot Citroën, Porsche AG, Saab, Fuji Heavy Industries Ltd., Suzuki Motor Corporation, Toyota Motor Corporation, Volkswagen AG, and Volvo. The quality ranks of the above five car manufacturers by this set of computations are given in the second graph below. As overall reliability ratings were not offered by Consumer Reports in 1995, Auto Reliability Percentrank averages were used for ranking the automobile manufacturers. 1. By the quality ranking based on the infrequency of trouble-prone models, Daimler, Volvo, and BMW AG had some good years, but 2005 and 2010 were not among them. 2. By both quality rankings, Daimler has taken quite a plunge from the mid-1990s. 3. By both quality rankings, Volkswagen AG and Saab have spent quite a bit of time in the bottom half of the quality-rank spectrum. 4. Save for Volvo in 2010, all five Europe-based auto manufacturers have resided in the bottom half of the quality-rank spectrum by both quality measures for both 2005 and 2010. To view the quality ratings of all of the auto manufacturers for a given year, click the applicable year.